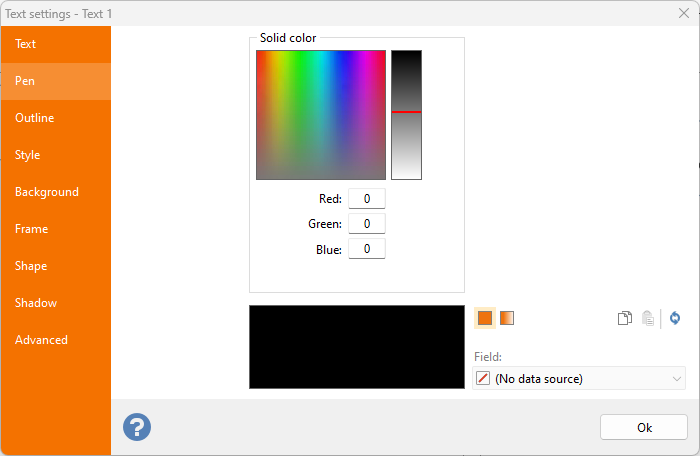 Colors are defined in the color tabs of the element properties dialogs. For example, in a text element, the Pen tab displays the controls needed to define the inner color of the text element. by right-clicking the color preview box, a popup menu is displayed that enables you to copy, paste, and reset the color to its default value. The color definition tabs enable you to define a solid color (a single solid color with no fading) and a fading color (two fading colors supporting opacity). The Fading mode will be available only when applicable. For example, in the case of a barcode foreground color it will not be possible to set a fading color. In these cases the Solid/Fading button will not be visible. Solid: a color selection area is positioned in the top section: by clicking it, you will select the color on which the mouse cursor is positioned. To the right, the brightness bar enables you to change the color range of the color selection area. 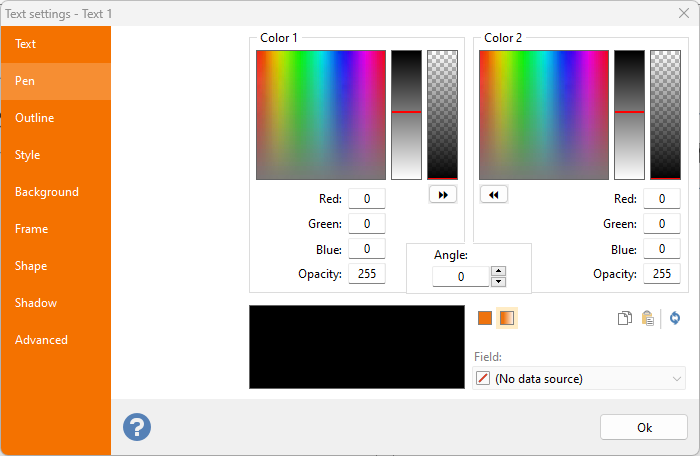 In the lower section, the Red, Green and Blue text boxes enable you to manually enter the RGB values that define the color (valid values range from 0 to 255). The lower rectangle displays the selected color. Fading: when in this working mode, the dialog box is split into two identical sections; each of which enables you to define one of the two colors that will be combined into the desired fading effect. In the upper part of each section, you will find the color selection area, the brightness bar and the opacity bar, that enable you to define an opacity value between 0 and 255 (where 0 is completely transparent and 255 completely opaque). Each of the two sections displays the RGB text boxes and the opacity text box. You can copy one color definition to the other by clicking the « and » buttons. The lower section of the dialog box displays the preview area showing the chosen combination. To its right are found the controls that enable you define the fading angle. Again, you can manually enter a value (between 0 and 359.9 degrees) or use the scroll bar. Fading mode is not available in the Light version.